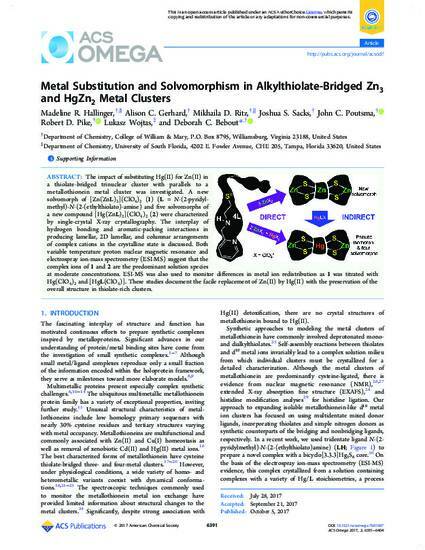 The impact of substituting Hg(II) for Zn(II) in a thiolate-bridged trinuclear cluster with parallels to a metallothionein metal cluster was investigated. A new solvomorph of [Zn(ZnL)(2)](ClO4)(2) (1) (L = N-(2-pyridyl-methyl)-N-(2-(ethylthiolato)-amine) and five solvomorphs of a new compound [Hg(ZnL) (2)](ClO4)(2) (2) were characterized by single-crystal X-ray crystallography. The interplay of hydrogen bonding and aromatic-packing interactions in producing lamellar, 2D lamellar, and columnar arrangements of complex cations in the crystalline state is discussed. Both variable temperature proton nuclear magnetic resonance and electrospray ion-mass spectrometry (ESI-MS) suggest that the complex ions of 1 and 2 are the predominant solution species at moderate concentrations. ESI-MS was also used to monitor differences in metal ion redistribution as 1 was titrated with Hg(ClO4)(2) and [HgL(ClO4)]. These studies document the facile replacement of Zn(II) by Hg(II) with the preservation of the overall structure in thiolate-rich clusters.